The 2018 midterm elections saw record voter turnout and a slew of "firsts" breaking barriers in politics. An estimated 113 million people participated in Tuesday's elections, shattering the record for voter turnout in a midterm election. About 49% of eligible voters cast ballots, up from just 36% in 2014. Participation has not approached 50% in a midterm election since 1914. That's... a very, very long time ago. Those voters elected a number of candidates set to break barriers in politics. Victories on both sides of the aisle have resulted in more women set to serve in Congress than ever before. With some races still to be decided, 95 women won seats in the House and 13 in the Senate, bringing the total number of women in Congress to 118, up from the current 107. But the night was also marked by a number of other monumental victories. Alexandria Ocasio-Cortez, 29, became the youngest woman elected to Congress. Rashida Tlaib of Michigan and Ilhan Omar of Minnesota became the first Muslim congresswomen to be elected. Jared Polis won the Colordo governor's race, becoming the first openly gay governor in the country. Sharice Davids of Kansas and Deb Haaland of New Mexico became the first Native American women elected to Congress. 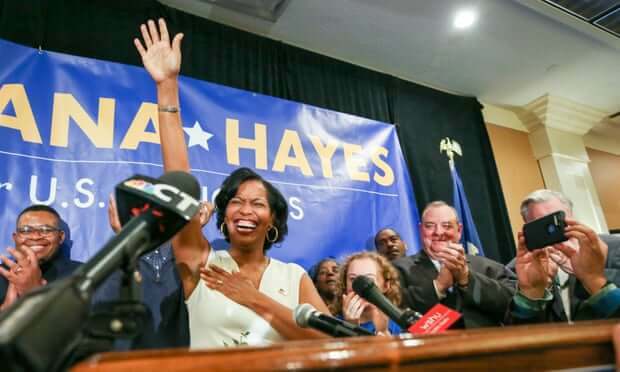 Ayanna Pressley became the first black House member from Massachusetts, and Jahana Hayes became the first black congresswoman from Connecticut. The pair represent the first black women elected to Congress from New England. Wow. And we're not even done yet! Marsha Blackburn became the first female senator from Tennessee. Janet Mills became the first female governor of Maine. Abby Finkenauer became the first female member of Congress from Iowa. And Veronica Escobar and Sylvia Garcia became the first Latina congresswomen from Texas. Do you hear that? That's the sound of a ton of glass ceilings being smashed. Democracy is cool. Voting is cool. Just two years until you get to do it again! Mark your calendars.